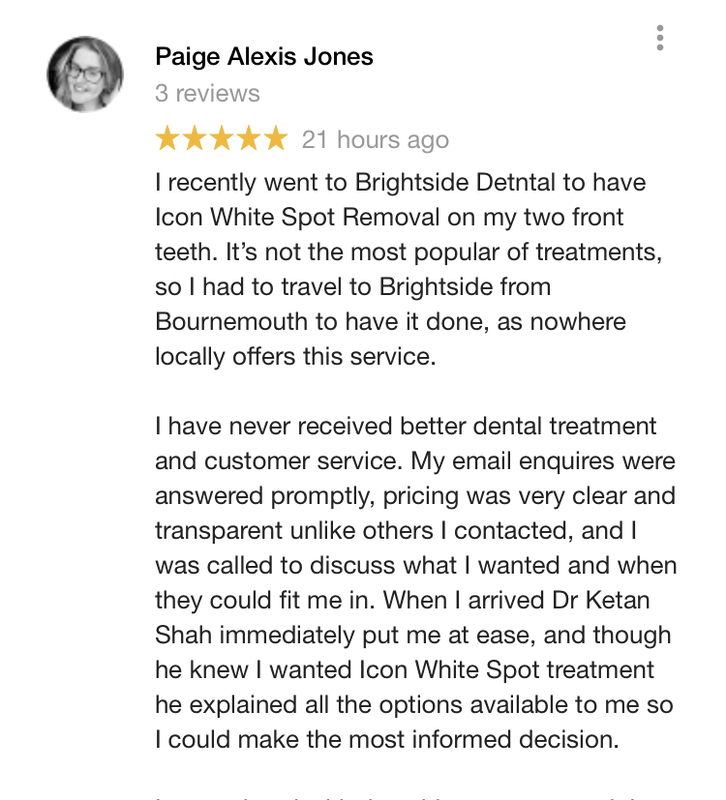 Paige made a 6 hour round trip to Brightside Dental, waking up at 5 in the morning because she was unhappy with white patches on her front teeth which had been bothering her for 10 years. Paige’s teeth before and after Icon treatment. Slight white patches evident due to dehydration of the teeth, which disappeared completely within a day. She had Icon dental treatment carried out in less than 45 minutes by Dr Ketan Shah and the patches were removed. Icon is a simple and non-invasive, drill free treatment that can be very effective in removing white patches. It’s not in widespread use by dentists in the UK, but is very popular in America, Germany and other European countries. 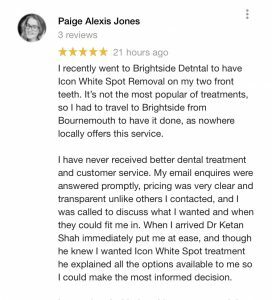 We have been using Icon at Brightside for over 5 years, with great results for suitable patients. Icon is a treatment where you see immediate results and you can eat and drink straight away. This is a fantastic treatment that can usually be completed in 1 visit and is often suitable for children as well as adults. 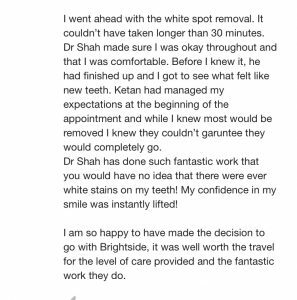 If you would like to know more about this treatment or know someone with white patches on their teeth, contact us on 020 88884401 to see how we can help. 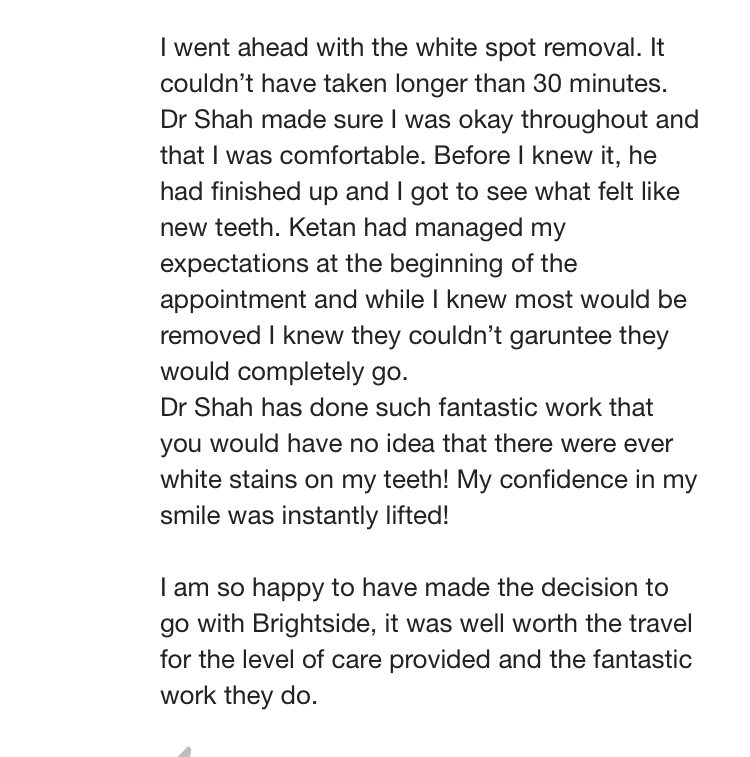 This entry was posted in Treatments and tagged Icon, patches on teeth, white patches on teeth on 11th February, 2019 by Brightside Dental.